Would You Rather Your Country Grow like France or Hong Kong? A paper posted on the Social Science Research Network looks at nations that are prospering compared to those that are stagnating. Not surprisingly, limited government and free enterprise policies are associated with better economic performance. Here’s an excerpt from this new research. What can we conclude about the effect of various policies on economic growth? What lessons can we learn from the growth miracles of recent years, and how can we avoid the sorry fate of the growth disasters? The countries that have been most successful at increasing their economic growth rates, and therefore at raising the living standards of their population, have all shared a commitment to increasing economic freedom, limiting the role of government, stamping out corruption, and strengthening the rule of law. They relied on free markets, rather than on central planning. They lowered their tax rates, and some even adopted a flat income tax. They made their labor laws more flexible, and allowed their firms to hire new workers more easily. They privatized their inefficient state-owned enterprises. They lowered tariffs, and opened up to trade and international competition. They courted foreign investors, and created a favorable business environment to lure them in. In other words, growth miracles have occurred in countries whose governments have adopted policies that reflect the classical liberal ideals of economic freedom, limited government and rule of law. Our brief survey of economic successes around the world shows that this lesson is universal: Countries as diverse as China, Estonia, Germany, India, Chile, South Korea and Slovakia have benefited from applying a similar set of market-oriented policies. The paper also makes a key point about economic growth and living standards. Over time, even modest increases in the economic growth rate can, furthermore, lead to vast improvements in the standard of living. If China sustains the eight percent annual GDP growth rate that it has achieved since its market-oriented reforms began in 1978, its inhabitants will double their living standards every nine years. By contrast, in the United States, which has grown at an average annual rate of about two percent, a doubling of living standards would require thirty-six years. This is an under-appreciated observation. The author cites a rather dramatic example, but the key observation is that even modest differences in economic growth can have a big impact on relative prosperity with a couple of decades. Here’s a chart I include in many of my Powerpoint presentations. 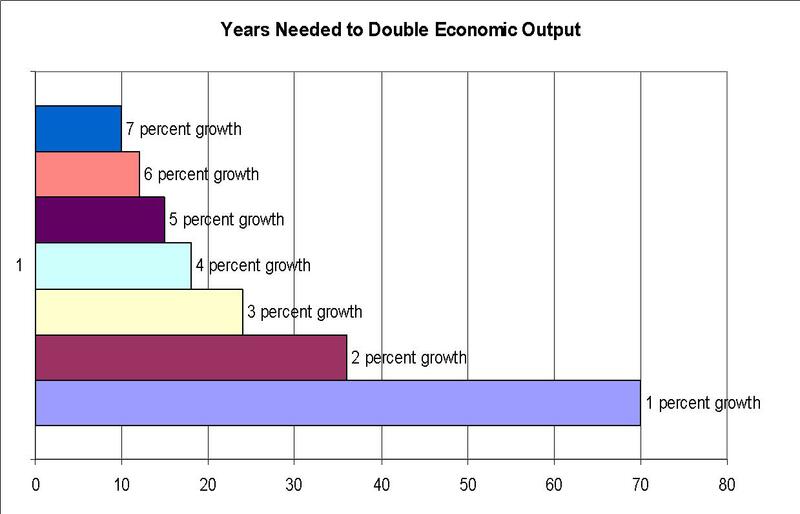 It shows how long it takes to double GDP based on different growth rates. Let’s look at a real-world example. Hong Kong has been growing by more than 5 percent each year for decades, while France has been growing by less than 2 percent annually. Now let’s ask a couple of big-picture questions. Why have Bush and Obama been trying to make us more like France? Do they fail to understand that this means less future prosperity for the American people? Don’t they realize that this means a loss of relative competitiveness? The death tax is a punitive levy that discourages saving and investment and causes substantial economic inefficiency. But it’s also an immoral tax that seizes assets from grieving families solely because someone dies. The good news is that this odious tax no longer exists. It disappeared on January 1, 2010, thanks to the 2001 tax cut legislation. The bad news is that the death tax comes back with a vengeance on January 1, 2011, ready to confiscate as much as 55 percent of the assets of unfortunate families. I’ve criticized the death tax on many occasions, including one column in USA Today explaining the economic damage caused by this perverse form of double taxation, and I highlighted a few of the nations around the world that have eliminated this odious tax in another column for the same paper. Politicians don’t seem persuaded by these arguments, in part because they feel class warfare is a winning political formula. President Obama, House Ways & Means Committee Chairman Charlie Rangel, and Senate Finance Committee Chairman Max Baucus have been successful in thwarting efforts to permanently kill the death tax. But I wonder what they’ll say if their obstinate approach results in death? Congresswoman Cynthia Lummis of Wyoming is getting a bit of attention (including a link on the Drudge Report) for her recent comments that some people may choose to die in the next two months in order to protect family assets from the death tax. For successful entrepreneurs, investors, and small business owners who might already be old (especially if they have a serious illness), there is a perverse incentive to die quickly. U.S. Rep. Cynthia Lummis says some of her Wyoming constituents are so worried about the reinstatement of federal estate taxes that they plan to discontinue dialysis and other life-extending medical treatments so they can die before Dec. 31. Lummis…said many ranchers and farmers in the state would rather pass along their businesses — “their life’s work” — to their children and grandchildren than see the federal government take a large chunk. “If you have spent your whole life building a ranch, and you wanted to pass your estate on to your children, and you were 88 years old and on dialysis, and the only thing that was keeping you alive was that dialysis, you might make that same decision,” Lummis told reporters. The class-warfare crowd doubtlessly will dismiss these concerns, but they should set aside their ideology and do some research. Four years ago, two Australian scholars published an article on this issue in Topics in Economic Analysis & Policy, which is published by the Berkeley Electronic Press. 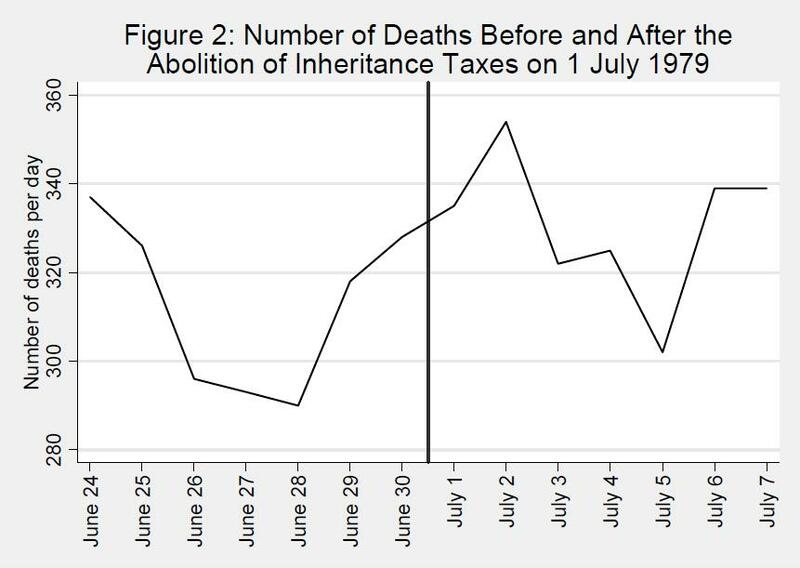 Entitled “Did the Death of Australian Inheritance Taxes Affect Deaths?”, their paper looked at the roles of tax, incentives, and death rates. The abstract has an excellent summary. In 1979, Australia abolished federal inheritance taxes. Using daily deaths data, we show that approximately 50 deaths were shifted from the week before the abolition to the week after. This amounts to over half of those who would have been eligible to pay the tax. …our results imply that over the very short run, the death rate may be highly elastic with respect to the inheritance tax rate. And here’s a graph from the article, which shows how many affected taxpayers managed to delay death until the tax went away. Obama and other class-warfare politicians now want to run this experiment in reverse. I already noted in another blog post that there are Americans who are acutely aware of the hugely beneficial tax implications if they die in 2010. In other words, Congresswoman Lummis almost certainly is right. I don’t actually think that Obama, Rangel, Baucus and the rest of the big-government crowd should be blamed for any premature deaths that occur. But I definitely think that they should be asked if they feel any sense of guilt, remorse, and/or indirect responsibility. The “good government” crowd tells us that voting is a “civic duty.” When I hear that type of nonsense, it makes me want to deliberately stay home. But I did actually vote today, in part to avoid lines on Tuesday and in part because I leave that morning for a speech in Florida. But why did I bother? The odds of my vote making a difference in any race are so infinitesimally small that there’s no logical reason to vote. But that’s if you view voting as an “investment good” – i.e., you vote in hopes of influencing the outcome. Voting only make sense as a “consumption good.” In other words, you do it just for the sheer joy of voting against someone (or, in very rare cases, because you actually want to vote for someone). Some libertarians argue that voting is wrong, for any reason, because it legitimizes the current system. 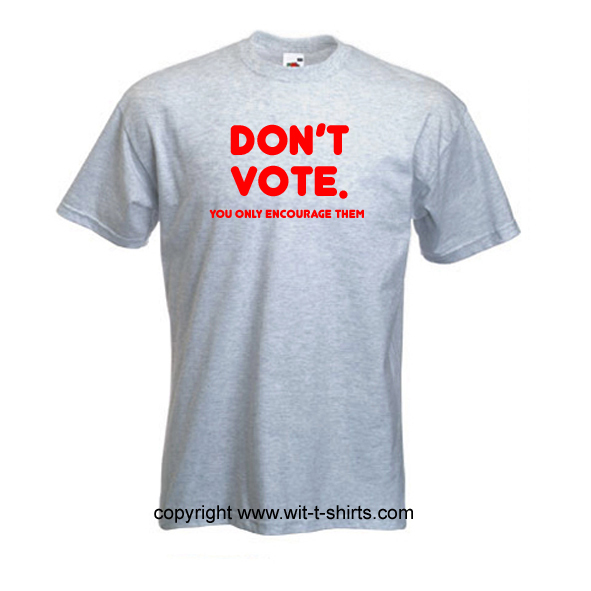 This is the sentiment that motivates this t-shirt, and it also is the title of P.J. 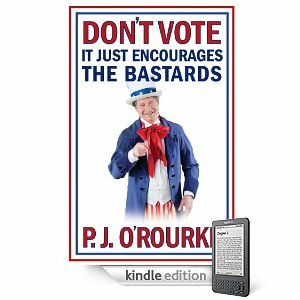 O’Rourke’s new book. But that argument, while superficially appealing, doesn’t make sense. Does anyone actually think that the corrupt crowd in Washington will suddenly stop stealing our money and trying to control our lives if fewer people decide to vote? I don’t think it would have the slightest impact on their behavior. I’m not sure if that’s a real quote, but it sure is accurate. In the past 15 years, I’ve debated in favor of a national sales tax, testified before Congress on the merits of a national sales tax, gone on TV to advocate for the national sales tax, and spoken with dozens of reporters to explain why the national sales tax is a good idea. Even though I prefer the flat tax, I’ve been an ardent defender of sales tax proposals such as the FAIR tax because it would be a great idea to replace the current system with any low-rate system that gets rid of the tax bias against saving and investment. I even narrated this video explaining that a national sales tax and flat tax are different sides of the same coin – and therefore either tax reform proposal would significantly improve prosperity and competitiveness. I will continue to defend the FAIR tax and other national sales tax proposals that replace the income tax, but I wonder whether this is a losing battle. Every election cycle, candidates that endorse (or even say nice things about) the FAIR tax wind up getting attacked and put on the defensive. Their opponents are being dishonest, and their TV ads are grossly misleading, but they are using this approach because the anti-FAIR tax message is politically effective. Many pro-tax reform candidates have lost elections in favorable states and districts, largely because their opponents were able to successfully demagogue against a national sales tax. The Wall Street Journal reaches the same conclusion, opining this morning about the false – but effective – campaign against candidates who support a national sales tax. In 16 House and three Senate races so far, Democrats have blasted GOP candidates for at one point or another voicing an interest in the FAIR tax. …FAIR tax proponents are right to say these Democratic attacks are unfair and don’t mention the tax-cutting side of the proposal, but the attacks do seem to work. Mr. Paul’s lead in Kentucky fell after the assault, and the issue has hurt GOP candidate Ken Buck in a close Colorado Senate race. In a special House election earlier this year in Pennsylvania, Democrat Mark Critz used the FAIR tax cudgel on Republican opponent Tim Burns. In a district that John McCain carried in 2008, Mr. Critz beat the Republican by eight points and is using the issue again in their rematch. This is a political reality that FAIR taxers need to face. …in theory a consumption tax like the FAIR tax is preferable to an income tax because it doesn’t punish the savings and investment that drive economic growth. If we were designing a tax code from scratch, the FAIR tax would be one consumption tax option worth debating. But…voters rightly suspect that any new sales tax scheme will merely be piled on the current code. Why Have Money Laundering Laws if They Impose High Costs and Yield No Benefits? It was only a few decades ago that there was no such thing as money-laundering laws. Instead, the focus of law enforcement was on the underlying criminal behavior (such as robbery) that generated ill-gotten gains. In recent decades, however, politicians around the world have passed hundreds of laws, created hundreds of agencies, and spawned several international bureaucracies and treaties. The theory is that crime could be discouraged by making it more difficult for bad guys to make use of any resulting loot. In reality, though, money-laundering laws have been a huge failure. From a cost-benefit perspective, there is an overwhelming case that these laws should be radically revised if not totally repealed. The current approach has significantly increased the expense of providing financial services, which is particularly burdensome for the poor and others at risk of not being able to utilize the financial system. These laws also have dramatically eroded privacy, forcing financial service providers and professional advisers to spy on customers and clients. To get a sense of what this means, here’s a blurb from a recent article in the U.K.’s Law Society Gazette. …an official from the World Bank’s Financial Market Integrity Unit…described his research on the kind of large-scale money laundering that takes place globally. At the end of his presentation, which he admitted touched only tangentially on the role of lawyers, he said that his research showed that the overwhelming majority of lawyer participation in money laundering took place by deliberate action of the lawyer, and not through unwitting manipulation by the criminal. Then I intervened. If that was the case, if money laundering overwhelmingly involves crooked lawyers and not unwitting ones, then why do we have the gigantic and unwieldy money laundering legislation in place for lawyers, with its duty to report suspicious transactions without tipping off the client, which turns the lawyer into a police officer? Obviously, if a lawyer is deliberately involved in the laundering, there are existing laws and professional rules to deal with it. But why must the balance of the rule of law, which depends on a client being able to confide information to a lawyer, be upset for a problem that does not exist? That is when the audience applauded. …I think it is time to use more of our resources to push for exposure of the lie on which the money laundering legislation is based. There is no evidence that unwitting lawyers’ reports are making any difference. Give us the evidence or repeal the legislation. From a utilitarian standpoint, these costs might be justifiable if they resulted in a substantial reduction in crimes against people and property. Unfortunately, there is no evidence that money-laundering laws have reduced criminal behavior (heck, they don’t even do a good job of intercepting criminal funds). Yet politicians and bureaucrats every year seek more laws and more powers in hopes of somehow turning a sow’s ear into a silk purse. The latest example is from the Financial Action Task Force, a Paris-based bureaucracy filled with people who make very good salaries thanks to the existing plethora of laws and regulations. These bureaucrats now want to make tax matters a predicate offense for money laundering. And they want such laws to apply across borders, so a bank in New York could be held accountable if a French worker or investor didn’t fully comply with France’s oppressive tax laws. Or a bank in Miami could be guilty of an offense if it helps a Venezuelan family protect its assets from Hugo Chavez’s thugocracy. So many costs, so few benefits. This video elaborates. Boehner Endorses More Medicare Spending: Meet the New Boss, Same as the Old Boss? While flipping through the radio on my way to pick my son up from school yesterday afternoon, I was dumbfounded to hear Congressman John Boehner talk about repealing Obama’s Medicare cuts on Sean Hannity’s show. I wasn’t shocked that Boehner was referring to non-existent cuts (Medicare spending is projected to jump from $519 billion in 2010 to $677 billion in 2015 according to the Congressional Budget Office). I’ve been dealing with Washington’s dishonest definition of “spending cuts” for decades, so I’m hardly fazed by that type of routine inaccuracy. To be fair, Boehner also said that he wanted to repeal Obamacare, so it would be unfair to claim that the interview was all Bush-style, big-government conservatism. But it is not a positive sign that Boehner is talking about more spending before he’s even had a chance to pick out the drapes for his new office.